Artist M.J. Levy Dickson's "Yellow Sunrise" done in charcoal and watercolor. “You see an eye. I see a flying saucer,” Bob Macaruso says with a shrug after scrutinizing a surrealist pencil drawing projected on the dining room wall before him. The drug and alcohol addiction program director had settled in on a recent Wednesday night for a slide-show presentation with a jury of coworkers, patients, and board members of Fields Corner’s Interim House residential treatment center, where he works. The house had been offered about a dozen artworks from the Art Connection, an eight-year-old, Boston-based nonprofit that facilitates the donation of art by creators and collectors to places such as the treatment center, as well as schools, hospitals, and senior centers. The Art connection requires that its recipients take great care in choosing the art, which will be theirs to keep. On Feb.18, they took three hours deliberating over 300 slides. A nature photograph of the Quincy quarries? “Bad memories,” said one of the residents, shaking his head. A patriotic assemblage incorporating Sam Adams bottles? “Can you make it O’Doul’s?” asks Gail Linehan, daughter of the house’s founder. An Asian-inspired print of mounted cavalrymen? “The four horsemen? I don’t know,” says Macaruso. The house’s executive director, Angela Fonseca, said that, “each room should have meaning.” She wanted a dynamic, psychologically engaging collection for the living room – currently decorated in framed Monet prints – so that men who are interviewing for entry into the six-month program have something to look at while they wait. They found accord on a set of cartoonish ink and watercolor washes with introspective-looking human figures interlocked in buzzing, whimsical arrangements. “We’ll tell the guys it’s called ‘Another Chance,’ ” said head counselor Ben Wade. 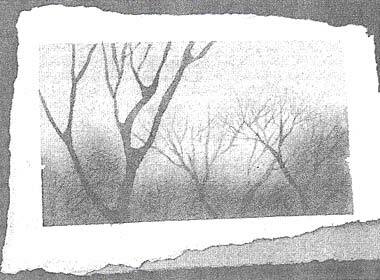 Wade saw meaning in the charcoal drawing of a bare tree and the sunny photograph of an arboretum he picked up for his counseling room.